In its own way, Toy Story is as important to film history as Snow White and the Seven Dwarfs. Before Walt Disney released Snow White in 1937, industry insiders referred to the project as “Disney’s Folly,” refusing to believe that a cartoon could hold anyone’s attention for the length of a feature film. In 1995, Pixar Animation faced similar accusations. Computer animation was new and interesting, but could it really be successfully harnessed for a feature? Pixar answered all skeptics with one of the greatest, most endearing animated films ever made. Toy Story confirms what every child already knows to be true, which is that when no one is around, toys come to life and move about the house. In this case, the toys all belong to a boy named Andy, and Andy’s favorite toy is Woody (Tom Hanks), an old-fashioned cowboy doll, complete with pull-string. The toys get nervous during Andy’s birthday party, afraid of being replaced by cooler, more modern toys. Woody does his best to keep everyone calm, only to become jealous himself of Buzz Lightyear (Tim Allen), a new toy who believes himself to be an actual Space Ranger. The storytellers at Pixar chose the perfect subject matter for their first feature film. Computer animation has a certain unnatural look to it, and whenever computer-animated humans are intended to look real, they often come off as creepy. So, the fact that most of the characters in Toy Story are made of plastic works in the film’s favor. Computer animation has come so far since 1995, yet Toy Story’s visuals continue to impress; tiny details on the toys like plastic ridges and trademark symbols are especially remarkable. Animation can take us places that live action can’t, and because of that, I’m usually disappointed whenever animation remains grounded and traditional. Toy Story wastes no time in seizing its full potential. During the opening credits, we get great shots from Woody’s point of view as Andy plays with him all over the house, and once the birthday party is underway, Woody sends a squadron of plastic army men on a breathtaking reconnaissance mission. It’s funny to see green-plastic paratroopers leaping from the banister, but it’s actually exciting, too. This brilliant action sequence comes early in the film, assuring us that we’re in for a special experience. Even more impressive than the animation is the story itself. Because of its original premise and strong character development, Toy Story would still have worked as a hand-drawn film or even as a comic book. Walking out of the theater, my father and I didn’t jump into a discussion about the visuals. We knew we had witnessed the future of animation, but we couldn’t stop talking about the characters. 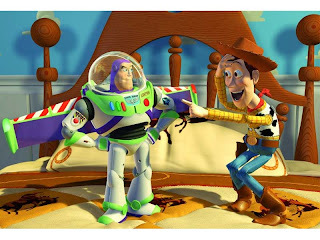 Woody and Buzz Lightyear quickly earned familiarity across pop culture, along with Buzz’s catchphrase: “To Infinity and Beyond!” People connected with Toy Story, and they still do; it reminds us of our childhood. It’s hilarious, and it’s surprisingly heartfelt. Every time I see it, I get completely caught up in the situations, and I find myself actually caring about these toys. Very few movies ace one of the industry’s toughest tests: appealing across both age and cultural gaps. Pixar repeats this miracle time after time and makes it look easy, but if it really were easy, other studios would do it. In the years following Toy Story, other filmmakers thought computer animation was a magic formula, as though any kids’ film could be computer animated and become successful. The more mediocre films that came out, the better Pixar looked. Beginning with The Little Mermaid in 1989, Disney experienced an animation renaissance, but around the mid-to-late-nineties, the quality of Disney’s hand-drawn films began to slip. As Disney’s traditionally-animated movies declined in quality, Pixar partnered with Disney and kept the magic alive. From Toy Story onward, Pixar held the torch of top-notch family entertainment higher than ever, churning out one masterpiece after another. In the early days, Walt Disney believed so firmly in the power of animation that he actually went into debt to complete Snow White and the Seven Dwarfs, and that level of passion and commitment is apparent in Pixar’s work. Later this year, Disney will release The Princess and the Frog, its first hand-drawn feature in over five years. I have high hopes for the film, because I believe in the power of hand-drawn animation. However, no matter what cinematic techniques are used, story matters most; Snow White taught us that in 1937, and Toy Story will always be remembered as the film that set that precedent again for a new generation. Many computer animated films have been made and will be made in the future, but I’m so very glad that Toy Story was first.